Pistachio Torte dessert was such a favorite of mine growing up. It was one that my grandma would make for us often. Whenever we went back home to visit, she would pull a pan out of the freezer, and I would be so happy! A few years after Grandma passed, I remembered her Pistachio Dessert, and wanted to make it. I really had no idea what it entailed. I just remembered Pistachio pudding, and some other layers with Heath bars crushed up for sprinkles on top. I searched every church cookbook I had that Grandma had recipes submitted to, never with any luck. I had checked with my Gram to see if she knew the recipe. Never any luck. I'd given up hope. Then one day, one of my cousin's asked if I would like some of our grandma's recipes... WHAT? YES PLEASE! Thankfully, she had the Pistachio Torte dessert. I was so happy. After seeing the recipe, I realized it had been in front of my face for a long time. South Your Mouth had posted her Chocolate Delight recipe, and I had seen her picture and read her recipe, it never occurred to me, that this recipe was so similar to the one I was looking for, but with a different flavor pudding. My grandma had a few different twists, but it was so similar. If I hadn't been so focused on the Pistachio, I might have had an easier time finding the recipe. Sometimes, I get a little to focused on the details to see the big picture. Preheat oven to 350 degrees. Mix flour and nuts. Cut in butter until you have a crumbly mixture. Pat in bottom of greased 9 x 13” pan. Bake for 15 to 20 minutes, until light golden color. Cool. While crust is cooling, beat cream cheese until smooth. Slowly add powdered sugar and mix until combined. Fold in 1 cup of Cool Whip, spread over the cooled crust. Mix pudding and milk until combined. Spread over cream cheese layer. Top pudding layer with remaining Cool Whip. Garnish with chopped Heath Bar. Place in freezer for 2 to 3 hours. Remove from freezer 20 minutes before serving. This is a beautiful torte! No wonder it's your childhood favorite. I'm glad that your cousin got the recipe....I love recipes that are passed down from generation to generation. There are just so many great memories and lovely stories behind them. :) I can't wait to give this a try. I love pistachio. This sounds yummy! It looks so unique with that green layer. Glad you were able to find the recipe! Saw your torte at Thursday's Treasures ... I've never heard of a Pistachio Torte. It looks & sounds incredibly delicious!!! Pinned ;) Thanks for sharing! Have a lovely Valentine's Day!! This looks so yummy. I love pistachio. Oh wow, I love pistachio pudding and this sounds amazing. WOW! I love sweets that I can squish around in my mouth so I want this NOW!!! YUMMMMMMMY!! Thanks for sharing your link at last weekends link party @The Weekend re-Treat! Hope to see you link up again this week if you haven't already! I love everything about this delicious pistachio torte. I'll be sharing this on my FB page tomorrow. Thanks so much for sharing this with Foodie Friends Friday "REcipes with a story" party this week. G'day! Looks like children of all ages would go YUM! I have never had a pistachio torte. This looks so good! Eeeek! I am so glad you found it! There is just something extra special about the recipes your grandma made for you and it is so cool that you got some of her recipes and this one was in there! 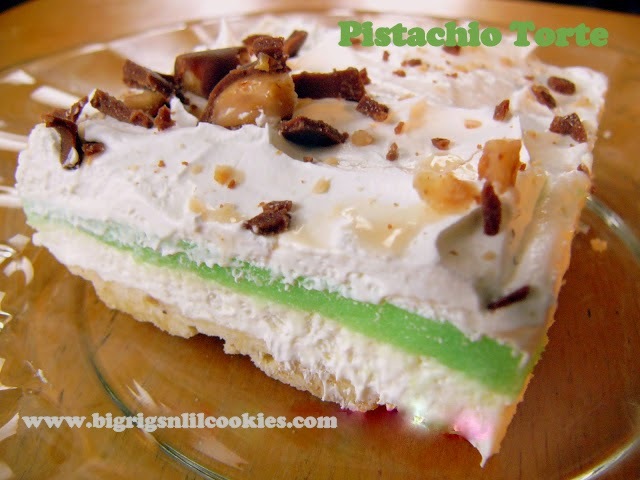 My brother is a huge pistachio fan and I am always in the market for a new treat to try. I can't wait to taste this! I remember having this long long ago! Thank you Kris for posting. I pinned! I will be making this for Sam before he leaves. Yum! - My dad liked one similar made with Chocolate Pudding. - Never thought of the candy bar bits on top. I love that this was hers and that you made it. I'm sorry she's gone. A Party With an Ice Cream Theme!